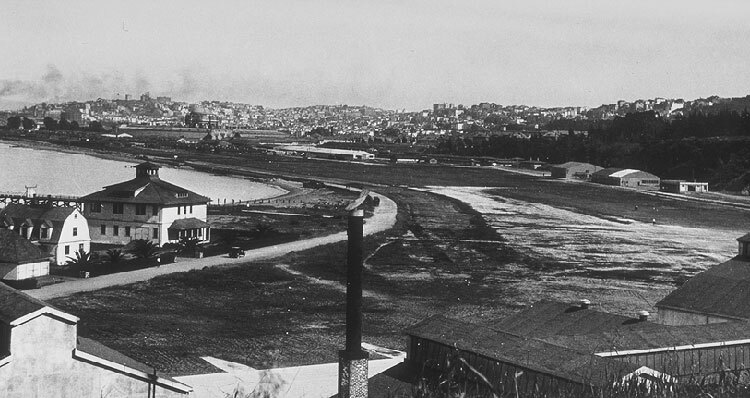 View from Crissy Field (left) to Richardson Bay, early 20th century. Named after a famous aviator, this airfield was built on landfill that had been placed in a tidal marsh and lagoon system at the time of the Pan-Pacific Exposition of 1914. In later years, even after it was no longer used as an airfield, it served as an industrial area for the Army. Its many warehouses were served by railroad tracks that ran along Old Mason Road. By 1994, when the Presidio was transferred to the National Park Service, Crissy Field's buildings and landscape were in disrepair after decades of deferred maintenance. Its shoreline was edged with concrete rubble tipped with twisted rebar; its heavily trampled dunes had few native species and a host of invasive weeds like wild radish and iceplant that flourished in the nitrogen-enriched soils (think dog poop). With substantial support from Haas family foundations--including the largest private cash donation ever made to the national park system--the Golden Gate National Parks Association embarked on an ambitious restoration program for the entire waterfront. By mid-2000, after years of public input and construction, its improvements should be completed. Thousands of native plants have already been installed in dunes along the shoreline where acres of rip-rap were removed; an eighteen-acre tidal marsh has been excavated and opened to tidal action through a reinforced channel opened along the beach. The combined dune and marsh restoration will provide habitat for a dozen or more plant species that have not been seen in San Francisco for nearly a century. In the six months since excavation began, ornithologists have already recorded 99 bird species in the marsh and nearby dunes. Crissy Field in the 1920s. 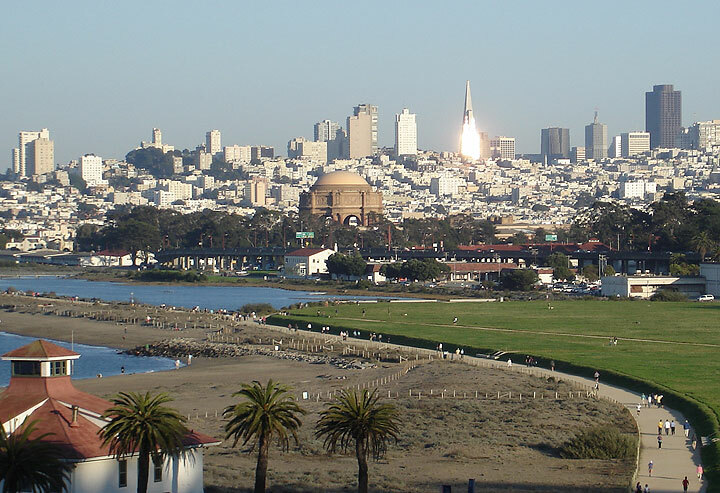 Palace of Fine Arts sitting between a sun-emblazoned Pyramid downtown and the bucolic, restored Crissy Field and marsh in the foreground, 2009, also visible in 1920 photo just above. 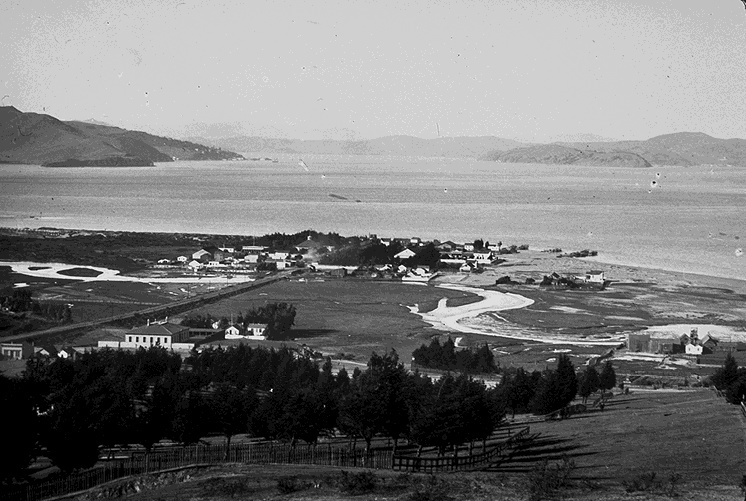 Historic photographs and coastal surveys demonstrate that the historic northern bayshore of the Presidio featured a long spit that extended east. A sand bar west of Alcatraz provided ample sand to the system; eddies caused by the flow of water out the Golden Gate moved sand along the shore; strong summer winds through the Golden Gate built up the dunes, including the high dune known as Strawberry Island shown on early maps. A tidal marsh developed behind this barrier beach (analogous systems include Limantour Spit and Estero at Point Reyes and Stinson Beach and Bolinas Lagoon in west Marin county). Fresh water flowing into the system from the Presidio watershed created a small lagoon and brackish conditions in the tidal marsh during the rainy season. The complex of tidal flats, channels, high marsh, and lagoons were highly productive for local wildlife. 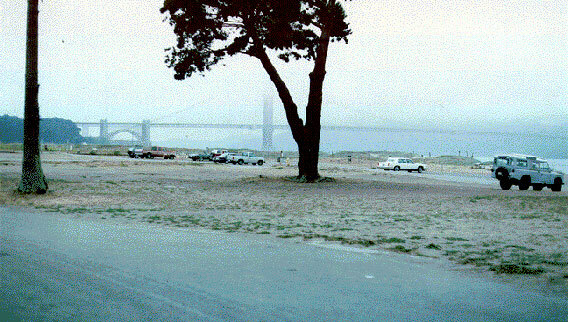 Crissy Field before National Park makeover, 1990s. For 150 years, ever since the Spanish soldiers first established the Presidio, the marsh and dunes just out their front door were considered pestilential waste grounds. 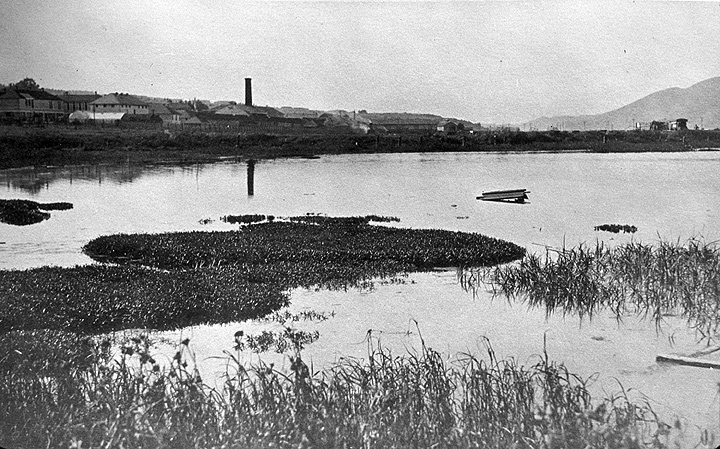 They became so as the marsh became the dumping ground for the various waste products produced by the growing garrison. By the 1890s it stank, providing the Army a reason to fill it in to create solid ground.